Above, a belated shot of the Los’ Christmas spread this year. I got home from my three week-long shoot just in time to celebrate with them. Note the turkey! 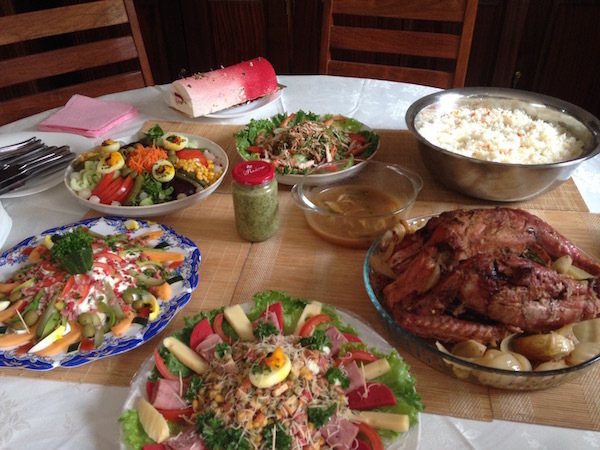 I have managed to make my mark in Senegal… The family loved our Thanksgiving turkey so much that they decided to make it again for Noël instead of their usual mutton. Unfortunately, I think there was a bit of beginner’s luck at play with the first one, because this second attempt didn’t turn out quite as delicious. I hope they nevertheless turn this into a new Christmas tradition, so that I can leave a legacy here! Ten food names with unusual origins. A world map of every country’s tourism slogan. A visualization of what each country is best (or worst) at. Italy’s last bastion of Catalan language struggles to keep it alive. As double-dutch wanes in New York, competition comes from abroad. On non-Swedes’ obsession with “hygge” (and the ironic conspicuous consumption that accompanies it). 32 movie accents analyzed by a dialogue coach. FOLO = fear of living offline. Atlas Obscura’s greatest finds of 2016. Spin the globe to listen to radio stations around the world. This makes me so sad, and it’s one of the reasons the call back to New York has grown fainter and fainter for me. What each country is most worried about, and how satisfied they are with the direction of their country. Comedians from repressive countries offer words of wisdom to Americans devastated by the election. Anyway, I wish I were more prepared to look back at 2016 and make some sort of meaningful statement about it the way everyone else seems to do when they have a blog.. but the only thing I’ve been capable of for the past few days is listening to George Michael and wallowing in angst about my lost youth and our doomed future. I should have quit at “Happy new year”….